Harvesting wild mosses and plants. Bringing in unwanted pests. "1)Using natural materials risks introducing snake mites. No. Using materials, vivaria or introducing snakes that have not been properly quarantined from dealers or keepers whose premises are infested risks introducing snake mites. Although there are many species of mite native to the UK and other temperate climates, none of them are parasitic on snakes and other reptiles. The dreaded snake mite itself (Ophionussus natricis) is thought to have been introduced to collections from Africa, possibly along with royal (ball) pythons, and cannot survive outside in our climate. There is practically zero chance of introducing them through natural material collected in the countryside." Well that's pretty vague is it not? Only covering snakes and mites when there is loads of other animals and organisms. This isn't about mites. It's about bringing in other harmful things like Nemerteans, scale bugs, snails, all kinds of creatures can come with harvesting outside things. They destroy the plants in the vivariums. Though you can also get spider mites. So this myth document on covers mites it's not covering all the other harmful organisms that can come with harvesting moss and plants form the wild. Anyways the mosses need a dormancy period which most mosses get during winter periods. which they won't get in vivariums. So Yeah I just wanna pick your brains on this and they are a "Bioactive" vivarium group yet they seem to think cocofiber and fake plants are bioactive. They truly don't understand the complexity of what a bioactive vivarium really is. Though it's not all that complex they just seem to to fully grasp what it means. Would you tell someone it's ok to be going out and harvesting mosses and plants fron the wild with no treatment to the plants or mosses or even wood? Re: Harvesting wild mosses and plants. Bringing in unwanted pests. Lukily it's just silver springs and not something really bad. My 10 gallon viv wound up with snails somehow and somehow they all vanished, luckily. I just wouldn't jeopardize my viv when I can just order some nice mosses and plants that will do well in my vivariums. I think grow out tanks really help. So many institutions do this in a sense - for example, many laboratories that produce strains of mice for research entirely rederive strains they acquire from elsewhere. It significantly reduces any biosecurity threat to their own population. The same can be said for most plants (I guess you can't really rederive a piece of wood lol), where step one is to treat, then place in a grow out plant only tank. Take a culture from there, treat, and grow it out again. And repeat as many times as you want. The whole "bioactive" push in the hobby lately gives me a headache. Most don't seem to really have any concept of what bioactivity (in science) even means. DragonSpirit1185 and TheCoop like this. Yeah there is definitely a process but the group leaders aren't even teaching people how to go about it the right way they are saying it's ok to but the items straight into the vivarium. I agree people just don't know what bioactivity even really means. I really wish these groups weren't even allowed to operate and spread such misinformation. No plants out of the wild should be harvested. Period. That implies collecting way more than you'd need for yourself. Leave the material where you found it. Collecting a small amount for yourself - and placing it in a grow out area for an extended period? Safer. A tad more sustainable as well. I've read about mountainsides that have, literally, had their moss rolled up and "harvested". That disgusts me. RRRavelo, boabab95 and CAPTAIN RON like this. Join the Southwest Frog Group FB Page! Harvesting or just getting plants from the wild. You can harvest all or just some. Just because you're harvesting doesn't mean you're taking it all. Though I get your point to an extent that it could imply taking more than you need. Though when people collect moss they could find a little patch of moss and by taking that entire little patch of moss that would indeed be harvesting. Go read the most recent blog entry (bottom of the forum page) if you'd like to know precisely what I refer to (among others). edit: I see it now when I click on 'Forum'. I just scroll to the bottom of this page. btw if anyone would like to inform them they are misinforming people, feel free. 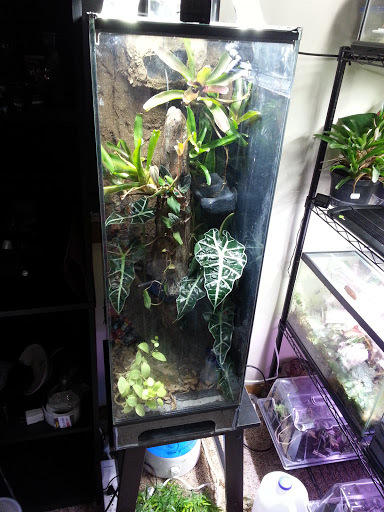 The group's name is Reptile and Amphibian Bioactive Setups. They removed me from the group when I started dropping knowledge on them. I didn't break a single rule. I guess they didn't like being challenged. Which wasn't even my intent to begin with. I was just letting the person know wild moss and plants aren't a good idea.
" so I'm just concerned about my captivated ones. " Aren't we ALL captivated by moss??? There are microorganisms that can survive being dunked in bleach?! What types of microorganisms can survive that harsh of a substance? As has been noted before and I'm sure will be again, bleaching plants doesn't really do anything to prevent the addition of unwanted organisms into the enclosures. DragonSpirit1185 and GandalfTheGrey like this. Yeah what Ed said plus it's diluted so it's not as potent. OK, the structure of the plants makes a lot more sense now, added with the dilution. Items collected from the "wild" also have the potential to carry pollutants and environmental toxins depending on where they are collected. Unless you live in a tropical zone most live plants and moss collected will not do well in vivs either. Fwiw, I am batting 100 on collected temperate mosses and worts in my orch box. This will be their 2nd winter without dormancy, and they are still growing/spreading. I think that it depends on what sort of animals you are keeping. With dart frogs-chytrid is the main concern. The ability of amphibian parasites to infect distantly related species varies greatly(cane toads in OZ were found to keep most of their own parasite flora, for example). Considering that chytrid is widespread but known snake pathogens or vectors such as snake mites are not-frog folk need to be a little more concerned about sources of terrarium materials than most other hobbies. This is an interesting discussion. I know I'm new here so I'll try not to step on any toes but what makes everyone think the plants they buy are safer than things they collect? The vast majority of commercially produced plants we buy are not vivarium grown in sterile lab conditions. Many if not most are grown in greenhouse settings...with frogs naturally occurring in them. Because they are grown in a more controlled environment. There's more pests in the wild. So it's not absolute but less risk. Some plants are still wild-collected though, for example many aquarium plants. I would say the vast majority of aquarium plants on the market are farmed. Maybe really niche stuff like bucephalandra and rare crypts still enter the trade from the wild, but for the most part wild plants don't often wind up in the hands of the end customer. That depends on your definition of 'wild'. Those 'farmed' plants are grown in massive outdoor ponds open to the elements. Maybe not in their native range but plenty wild if you consider all the access and exposure they have to wildlife. I'm a south Florida guy. I've been to all the big suppliers in south Miami of various plants, both terrestrial and aquatic, and fish, both fresh and marine. There is nothing sterile or even secluded about where the stuff we buy comes from. It's honestly just not practical most of the time. It all just seems to me like a nice illusion that 'farmed' or 'cultured' stuff is safer. It's honestly not from what I've seen. People around these parts pretty much always advocate for basic sterilization procedures regardless of the provenance of the plants. "Everyone does it. Don't let them lie to you, I know a lot of people who do it. Moss where I live is the cleanest thing ever. You can drink water from what the moss is holding it and have no issues. Plus moss is very fragile so any chemicals would've killed it a long time ago." Um moss is not the cleanest thing ever. It's not just chemicals you have to worry about. This guy is entirely new and thinks just because he has a friend who owns a reptile business or something that it makes his friend an expert. I thought so too when I was a n00b and was spouting off with things I was told by that person and boy was a wrong. I used to spread misinformation due to faulty sources. Last edited by DragonSpirit1185; 01-31-2016 at 07:53 PM. I'm pretty sure this is based on a survival "tactic" where dehydrated people squeeze moss for moisture. Not sure how he turned that into wild moss being completely safe to just throw into a tank willy-nilly. I will say I occasionally collect moss, but it's "sanitized" (to the best of my abilities), and grown in a separate room before i collect from the tray and use it (and I usually sanitize between collecting from the plant room and putting in tanks as an extra precaution). Last edited by boabab95; 02-01-2016 at 10:39 PM. Lol, reading through this, in my very first pdf tank (back 6-7 years ago) I used some wild "harvested" moss. I boiled it for about 10 minutes and set it up in the cage. The boiling killed the moss, but somehow, a few snail and worm eggs survived. I was battling snails and worms in that tank for weeks before I decided to move the inhabitants for a bit and completely re-do the entire cage. Don't wild collect! It's more trouble then it's worth! You can get something undesirable from anywhere and unless someone has documented statistical evidence that they can produce something that is "cleaner" in a way you care about then in all cases you should try to mitigate your risks on your own. We could bat back and fourth for days and hundreds of posts about different scenarios but at the end of every day there is only one way to significantly reduce your risk of invasive pests and that is to do all the treatment yourself. And even then we can discuss for hours at length what treatment methods are most effective. Lets add some context to this argument. The push for clean sources didn't occur that long ago here on the boards (about 2004-2005) and in the hobby. It was primarily to prevent some parasites that can show significant cross infection such as rhabdiform nematodes and can build into super infections. See this discussion in http://www.dendroboard.com/forum/pla...uarentine.html for some of the early conversation. Prior to about that time people routinely purchased, collected, and used plants that were grown either in the wild or outside with little or no concerns as to unwanted hitchhikers. There were (and are) people who also argue that a wide diversity of microfauna is of benefit and people should simply manage problems like snails in their enclosures. At that time there was little information as to the effectiveness of attempting to disinfect plants in that matter but there is good data coming out not that it really isn't that effective (and that is before we consider things like dilution due to reactions with the plant materials). This data has come about due to the outbreaks of infections from consuming salads or other uncooked vegetables over the last ten years or so and it really does show that it is pretty ineffective so it just functions as a panacea for the keeper. An item that is rarely addressed in these conversations is that some plants are pretty much impossible to disinfect in this manner. Bromeliads are a classic example as the tightness of the leaves prevent penetration of the solution. with respect to the bioactive groups, even if you utilize sterilized soils etc your going to end up with a bioactive substrate almost from the start. This is because a lot of the microorganisms are going to be added with the plants, dust and water. The problem I've seen in virtually all of their recommendations is that the amount of substrate is insufficient to manage the waste of even pretty small animals so the substrate still should be changed on a routine schedule. One way to enable that is to make the systems a flow through system so the addition of water flushes the extra nutrients out of the system. This is where the belief in the use of isopods and springtails to control fungal growths and clean up after the animals has gone off the rails. If the conditions in your enclosure are conducive to the fungus then its biomass is going to increase far far faster than the populations of isopods etc can respond (otherwise we would see far far less mushrooms in the wild). This is the same for the waste materials. boabab95, DragonSpirit1185, GandalfTheGrey and 1 others like this. I don't see how you can definitively state that, "bleaching plants doesn't really do anything...". Are you suggesting that the bleach solution loses all of its effectiveness simply because it contacted plant tissue? Granted there are tons of variables to take into account regarding the efficiency of the process, but I'm not willing to concede that it does absolutely nothing in terms of sanitation or pathogen reduction. I think he means (and please correct me if I'm wrong Ed) that there are many ways for air pockets to be created in plants (bromeliad axils, etc.) where pathogens and unwanted invertebrates can hide, staying out of reach from the bleach. Last edited by boabab95; 02-12-2016 at 02:19 AM. I think what he is saying when it comes to getting rid of all pests then it's not completely effective same with getting rid of possible pathogens and contaminates due to the fact the pathogens and such can go down into the plant's crevices. It's not pointless but it's not the end all be all with plants. it should still be done. And that absolutely could happen, depending on the tissues, trichomes, and other structures of the plant, as well as bits of soil and external organic matter that, when not rinsed away, could shield nasties from the caustic agent. I just don't think that the process should be written off entirely. I agree Dane and I'm unaware of a better reasonable alternative to disinfecting living plants going into vivariums. Bleach is a proven and efficient broad spectrum disinfectant but like with any form of disinfection or sterilization (including steam sterilization) if the mode of disinfection or sterilization cannot come into contact with the entire surface of an object then disinfection or sterilization of that object is considered compromised. What I don't understand about the Science Daily article was this; "We found that because of the topology of the spinach leaf, nearly 15 percent of the surface may 'see' a bleach concentration that is 1,000-times less than that of the rinse solution," I don't understand how the topology of a leaf could effect concentration strength on certain areas of the leave unless saying that the concentration is 1,000 times less is another way of saying it's not contacting at all. This seems more like an issue of either spraying down leaves with a bleach solution on leaves that are already wet with water thus immediately diluting the solution on spots that hit water droplets or an issue if they are mixing the bleach solution as it is being administered rather then using a premixed, more homogenous if you will, solution. Without knowing the specific methods being used in this article it's hard to draw and apples to apples comparison to submerging living plants in a bleach solution for a determined period of time and then rinsing by hand. Ed, in light of what you posted about the potential ineffectiveness of bleach solution soaks is there a more effective reasonable alternative you could suggest? There are multiple things that are occurring that directly impact the ability of the bleach to sanitize the plant materials. First off we have the problem of dilution due to reaction with the plant materials, soil or other organic materials in the solution. Second most people ignore the fact that hypoclorite ions are unstable over time which means that the bleach solutions used to make the dips reduce their effectiveness over time as the loss of hypochlorite further dilutes the bleach. So bleach that has been sitting for awhile is requires a different dilution ratio to be in the correct zones. What I don't understand about the Science Daily article was this; "We found that because of the topology of the spinach leaf, nearly 15 percent of the surface may 'see' a bleach concentration that is 1,000-times less than that of the rinse solution," I don't understand how the topology of a leaf could effect concentration strength on certain areas of the leave unless saying that the concentration is 1,000 times less is another way of saying it's not contacting at all. I can think of at least two things that can contribute to it. Keep in mind that the shape of the leaf exterior can easily have topographic features that combined with the wax cuticle can prevent the hypochlorite molecule from getting close to the surface of the leaf (also ignoring the reaction of the bleach with the organics of the leaf which then further reduces the concentration of bleach at the surface of the leaf). I would expect that leaves with even greater textures would result in even greater levels of protection. Heavier waxy coating such as those found on bromeliads and some other plants are going to be even more problematic as cracks or irregularities in the waxy cuticle will further shield pathogens from contact. The tests were done on submerged leaves and not sprayed materials using a specially designed flow chamber. The original news article is here UCR Today: How Clean is Your Spinach? I actually cannot think of a single disinfectant that does not suffer from the same drawbacks. If you add a surfactant to the bleach solutions then your going to have to use a sufactant that doesn't react with hypochlorites and works at that pH. If you go back into the original discussions the bleach suggestion was developed out of what was done with prepping plant tissues for cloning. It was brought up because people were routinely getting cuttings from one person's enclosures and going home and installing them into their own enclosures which is an issue with respect to pathogens. At this time people place excessive emphasis on bleaching the plants which due to a number of factors such as the lack of ability to contact the surface of the plant (along with other issues) pretty much can be said to be marginal at best and totally ineffective at the worst resulting in false confidence. okay....I get the issue with the leaves & how bleach can deteriorate as far as being an effective method of "sterilizing" (obviously that is not the case....)...so then what are we left with? What has been written makes perfect sense...but we dear readers are left with a dilemma...what is the the best practice for the ultimate end?